Pepper Johnson was drafted by the New York Giants in the second round of the 1986 NFL Draft. With the Giants, he was a member of both the Super Bowl XXI and Super Bowl XXV-winning teams, under head coach Bill Parcells and assistant Bill Belichick. After the 1998 season, Johnson retired from the NFL with career totals of 25.5 sacks, 12 forced fumbles, 14 interceptions, and over 1,200 tackles. 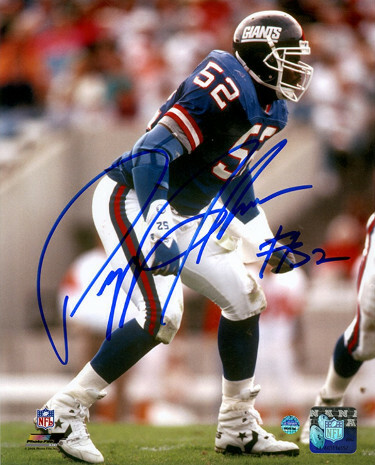 Pepper Johnson has hand signed this New York Giants 8X10 Photo. Steiner Hologram and Certificate of Authenticity.